Migraines are extremely painful, recurring headaches that are sometimes accompanied by other symptoms such as visual disturbances — seeing an aura — or nausea. There are two types of migraine — migraine with aura, formerly called common migraines, and migraine without aura, formerly called classic migraines. If you have a migraine with aura, you may see things such as stars or zigzag lines or have a temporary blind spot about 30 minutes before the headache starts. Even if you don’t experience an aura, you may have other warning signs in the period before the headaches starts, such as a craving for sweets, thirst, sleepiness, or depression. Chiropractic care or spinal manipulation therapy has been a proven method for individuals seeking an alternative for migraine treatment. Research has shown that in the case of tension and migraine headaches, manipulative therapy can be as effective, if not more effective, as preventative medications in helping to keep off the onset of migraines. 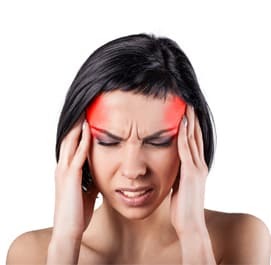 Once a migraine has begun, chiropractic therapy, a natural treatment method, can also greatly reduce the painful symptoms if care is given in a timely manner. Research has shown that most migraines originate in the spine, often because of misalignment of the vertebra which can then irritate the nerves that travel the length of the spine to the brain. This misalignment makes individuals more prone to chemical imbalances in the brain. Some studies have shown that manipulating the vertebrae—a chiropractor’s specialty—relieves the pressure against inflamed nerves and can in turn relieve the headaches, this is certainly true for the hundreds of migraine sufferers who swear by their chiropractor’s treatment of their own personal migraines. Chiropractic treatment also deals with many of the causative factors in regards to migraines such as relieving the restriction in movement in the neck, muscle tension in the neck, as well as muscle tension in the upper back and shoulders which when it is not corrected can lead to posture problems that may influence migraine occurrences and severity. If correctly used as a form of preventative migraine treatment, periodic chiropractor adjustments (or spinal manipulations) can keep the spine and cervical bones aligned more properly in order to help avoid the onset of migraines in the first place. Studies have even shown that individuals who receive normal and periodic adjustments can actually begin to feel when their spine and cervical bones begin to get out of line and can know when a simple visit to the chiropractor’s office is needed so that they can schedule for an adjustment and can ward off the onset of the migraine and the symptoms that are associated with an attack. Other therapies and nutritional supplements may also assist with the management of migraines.